There’s something strange happening in the ukulele world online. Swathes of ukulele players have joined a very special community that has developed over the last 6 months. The brain child of singer songwriter and front man for The Small Change Diaries, Nick Kemp, the Original Ukulele Songs project was set up to provide an online space for existing ukulele songwriters to showcase their music. But something extra special has occurred. Between the team of Nick Cody, Bianca Brochet and myself who moderate, mentor and encourage and the songwriters who regularly contribute, new aspirational songwriters have joined in the experience. Some people who have never written before tune in to see what its about and then very often begin to put pen to paper themselves. The OUS group works on the idea that good music and songs all come from strong communities and that is essentially what it aspires to create online. Harry has steadily built up his confidence and songwriting ability to the point where his output is deeply appreciated by OUS and ears outside of it. Having gone some way to achieve that, what is it about the OUS community that has put Harry in the right direction? So on any given day you may well here a songs ranging from novices like Harry to well respected professionals such as Victoria Vox who is headlining this years Grand Northern Ukulele Festival in the UK. The variation is unlike many other pages and this has been compounded by the fact that many of the songwriters are encouraged to collaborate. This year at the Grand Northern Ukulele festival, I met up with a man called Alan Thornton form the United States for the first time. Despite there being a rather large pond between us, Alan and I have been songwriting together after meeting through the OUS. But we’re not the only collaboration. On the main OUS website you will see countless artists and their collaborations with each other taking establish writers down paths they never expected. The OUS community sponsored a stage at the Grand Northern Ukulele Festival in the UK last May, where a select handful of OUS songwriters performed. The Facebook page, the website and the stage all had a global village feel, and we are looking to continue our work with representatives in many different countries from the USA, Canada and New Zealand. With Love My Ukulele being based in New Zealand, we would be delighted if any songwriters from New Zealand felt they were encouraged by visiting our online page or website and contributing from an already well establish and beautiful New Zealand songwriting tradition. You can visit the facebook page and join up here. The website for the OUS is here. You can get a taste of Matt Hicks’ music here. He’s not just full of advice. The man can sing. Sort of. Listen up! In this post we wanted to share with you an advanced ukulele playing technique called strum blocking. Strum blocking is a way of playing single notes with strums. You block off the strings you don’t want to sound so only one note rings. There are a few advantages to doing this. It makes for a much smoother transition between chords and single notes in terms of tone and in terms of playing. It also gives you much more attack and makes it easier to play quickly. The first thing you need to get down is how much pressure to put on the strings. You want to rest your hand on the strings hard enough so they don’t ring but soft enough that you’re not fretting them. Test it out by resting your fretting-hand fingers on all the strings and strumming. If you hear a sharp click like the first half of this MP3, you’re doing in right. If you hear some tones coming through like in the second half, press a little harder. Keep reading the original full tutorial over at UkeHunt. If you want to see this technique done really well you have to check out James Hill playing Down Rideau Canal. Introduced by Jamie Houston. Original Article by Ralph Shaw. 1) Practice for one minute – every day. 2) Keep it fun. Remember it is called PLAYING the ukulele. 3) Really listen to your instrument. 4) Any time can be practice time so keep your instrument/s within easy reach. 5) Get a good instrument. 6) Practice with performance in mind. 7) Consider the future if you fail to practice now. So if you won’t practice for you, at least do it for the sake of your instrument. These tips have obviously been abbreviated, so to read the full explanation of each of them and find out which teachers put them forward, please click here for the original and full article on Ralph Shaw’s Blog. Last time I gave you the first five of ten things you can do to improve your songwriting. 6) Write From a Place of Emotion. A good place to start is by writing your song from a place of strong feeling (although it’s not a prerequisite, volumes of wonderful music have come out of emotionally neutral states.) I find that writing from your gut has a way of clarifying the thought processes. However it is quite possible, even likely, that the message the audience hears may have nothing to do with the original intent of the writing. When Chris Difford of 1970s band Squeeze wrote Tempted by the Fruit of Another he was writing about his discovery that their bass player had been approached by another band. Listening to the song you just assume it’s his girlfriend who has been tempted to leave. Howard Kaylan, of the 1960s band The Turtles, wrote Elenore with deliberately flawed lyrics as a way to get back at his record company’s demands for “another Happy Together,” their previous hit. However such inept lines as: You got a thing about you and You are my pride and joy etcetera (who uses etcetera in a song?) came across as heartfelt expressions of teenage exuberance and the record buyers loved it. Another example is one of my own songs: Movie Stars, High Rollers and Big Shakers which began life as an emotional rant about an aborted Las Vegas performance possibility. I was happy with the chords and tune but the lyrics of the song made it unsuitable for every occasion. On the suggestion of another songwriter I rewrote the lyrics to be about a failed Las Vegas marriage and then the song came together. Do yourself (and me) a favour and get the song from iTunes: for just one dollar you’ll experience a rip-roaring and smile inducing musical ride accompanied by the superb trumpet of Bria Skonberg. It’s distressing to cull those beloved verses that once meant so much and may have taken hours to complete. But if they no longer serve the song then you have to let them go. You’ll know you’ve done the right thing if you feel lighter and better off for having eliminated the excess. It’s like decluttering your home of junk. Songwriting doesn’t reward pack-rats and hoarders. Know specifically what your song is about and make every lyric serve the main message of the song. Watch for unnecessary repetition. If there are lines being sung more than once, ask yourself for what purpose. Repetition can be a powerful way to hammer a message home or it can be a powerful way to induce boredom. 9) Don’t Quit Till It’s Done and Know When to Quit. One of the greatest mistakes new songwriters make is in thinking their song is complete when there is clearly much work still to do. I’m not the only one to have grimaced while listening to some expensively produced drivel from a singer-songwriter who has gone ahead and recorded a song that still sounds like a first draft. When you think your song is finished keep playing it to yourself. Be hyper-alert for any line or verse that gives you a small but uncomfortable feeling of something not quite right. Be ultra-vigilant for melodic lines that sound like they could have come from any one of a thousand songs. Get super-critical of parts that niggle. Ruthlessly hunt down awkward phrases and make whatever changes necessary. But leave the good stuff alone! Many music and lyric choices don’t make intellectual sense, they just feel right. Develop the wisdom to know the moment when there’s nothing left to add or cut: that’s when your song is finished. 10) Creativity Works like a Muscle. Make a habit of creativity and exercise it often. Know that much of what you create, especially in the beginning, will probably never be worthy of performance, but that’s okay. It’s more important that you do something. Make songs that take the listener on a journey. Figure out how chords and melodies create tension and release. And craft your song to include those climactic moments. The best way to learn is by actively listening to other people’s songs; memorize them, dissect and analyze them, and thereby become a more effective self-critic. As the popularity of the ukulele grows, so does the number of ukulele groups and jam sessions. How to make yours better than average? In this article Jim D’Ville shares practical tips that EVERY jammer and jam leader should know! This article is in C6 tuning (g, c, e, a). Join the ukulele revolution and after an incredibly short learning curve you are ready to jam! Yes, the jam session, crown jewel of the phenomenon known as the ukulele club. But how does one go about facilitating an “interesting” jam, not one in which people sit stone-faced like Easter Island statues staring at their music and strumming in a rhythmically mono-syllabic down-up-down-up pattern with the musicality of someone dribbling a basketball? If you want your jam session to sound good from the very first note, get the group in tune. Have everyone tune-up their ukuleles, then have the group tune their ears and voices. 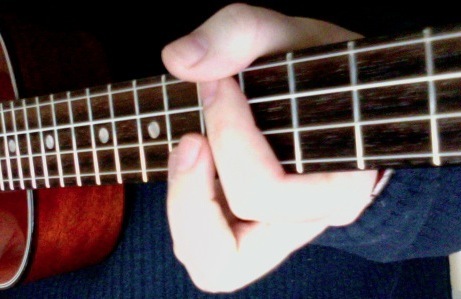 I use an A-440 tuning fork to accomplish this (since the first string on the ukulele in C tuning is tuned to A). Strike the A fork on your knee and place it on your uke. Hum the resulting A tone. Get the group to join the hum fest. At this point you can introduce the concept of playing together in time. Strike the fork again, place it on your uke and count off 3-4-1 (4/4 time-four beats per measure). On the 1, get everyone to loudly sing: “AAAAAAAAAAAA!” In a group setting, this usually comes out sounding pretty good. How does one go about facilitating an “interesting” jam, not one in which people [strum] with the musicality of someone dribbling a basketball? Move Up To Three Chords! From buzzing and broken tuners to storage and re-stringing, Gordon and Char Mayer take you through the essentials of ukulele maintenance and DIY repair. 3. how to recognize problems that are best left to a professional. Most importantly, you bought your ukulele to play it. It is made to be used. In fact, a strong argument can be made that playing it will keep it in better condition. If you keep it in a case, then you likely won’t play it much; strange, but the very act of getting up out of your chair and opening the case is often too much of a barrier. Better to keep it on a wall hanger or floor stand where you can just pick it up and pluck it if only for a minute or two. Just don’t put it in a place where it receives direct sunlight (more on this later). To read more please click here to see the original and full article on James Hills’ www.ukuleleyes.com website. We encourage instrument owners to play and enjoy their instrument. It doesn’t need to be handled like an egg, but following some common sense measures will help to minimize problems. Re-stringing your instrument is the best thing you can do for its tone; this often fixes apparent buzzing and intonation problems that have crept up as well. You should be putting on new strings about every 3 months. When you do, you’ll be surprised at what a difference it makes.